20111215 - Up an atthe desk all day. 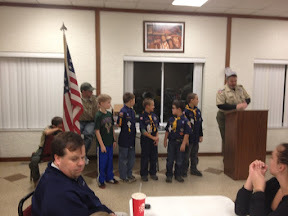 Then we ate a fast dinner and the whole family to the Scout Pack Meeting. It was a normal meeting where we made Christmas cards to send to the troops overseas. Then there were the awards. Jack got a gift card for selling the most expensive cake at the last Pack Meeting. Then we as a family were called up for an award; the BSA Fun For the Family award. This award has not been awarded in our pack for over 10 years... We had to one year to get a bunch of stuff done. Some of the things we did were: Happy Hikers, Farm Visit, Family Garden, Church Help, Family Reunion, Game Day and Holiday Tradition. It was a nice ceremony and we all got a patch to wear. After the Pack Meeting we headed to the coffee shop for some hot chocolate and fancy coffee.